Haha, not your typical romantic story… We had taken our daughter on the carriage ride down Court Street that they run through the holidays. We had just gotten home and I was getting my daughter ready for bed, and Adam came up behind me and asked me to marry him. He originally bought an ornament to hang on the Christmas tree and ask me on Christmas but we are both really bad about waiting and surprises – so he said he just couldn’t wait any longer. Her moment: I had struggled picking the music for the bridal party and for myself to walk out to. Two days before the wedding I decided to look on YouTube for instrumental versions of songs that were important to us. One of our first dates and his first ever concert was Journey. I found the most beautiful instrumental version of Journey’s “Lights” for the bridal party to walk out to. 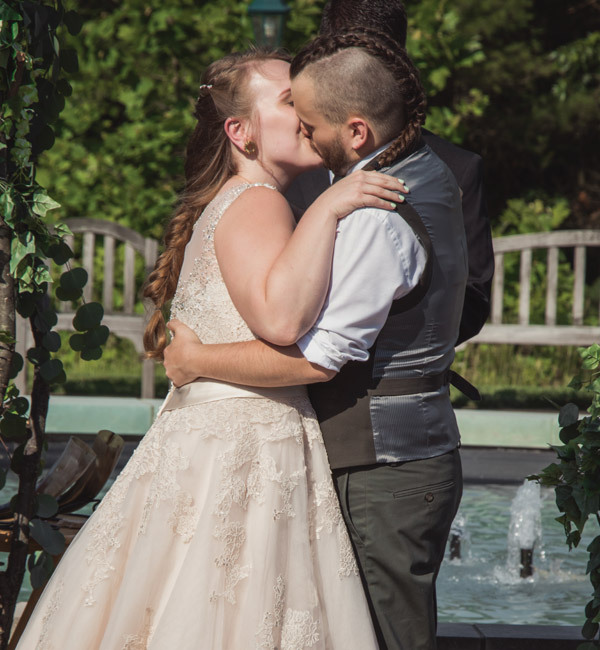 For myself, I walked down the aisle to an instrumental version of Bruno Mars “Marry You.” Adam had said that he wasn’t going to cry, and when I rounded the corned to walk down the aisle, there he was, crying. He said he started crying as soon as he heard the music I chose. His moment: The most memorable moment for me was watching our daughter walk down the aisle throwing her flower petals, and then I looked up and saw Whitney walking down the aisle. Seeing Finley, our daughter, made me emotional and then seeing my future wife just pushed me over the edge. 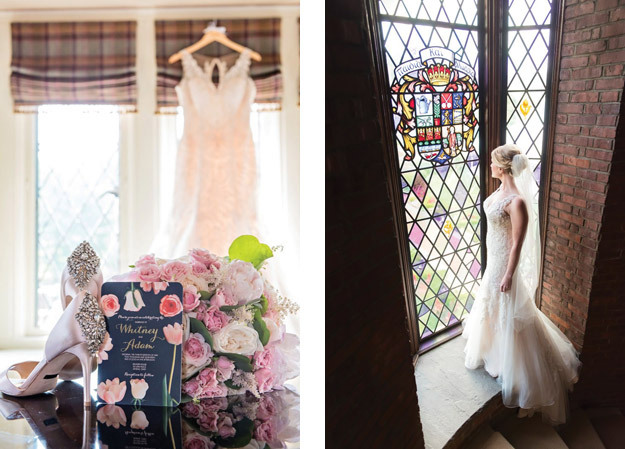 The bride wore an ivory, Mori Lee wedding dress. It was a fit and flare gown with appliquéd lace over tulle. 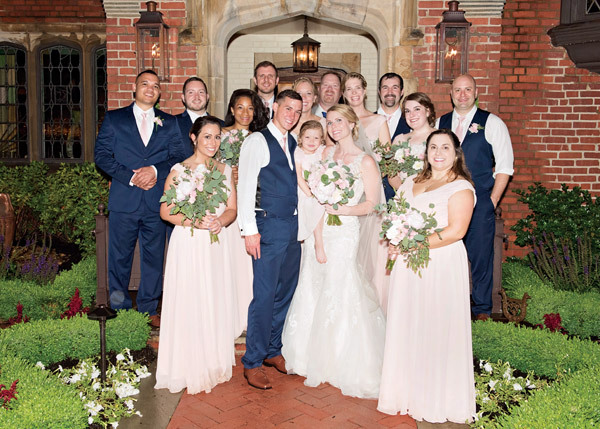 The bridesmaids wore blush pink chiffon floor-length gowns. We used The Flower Man out of Columbus. What’s unique about them is that you go up the day before your wedding with your bridal party and construct all of the flowers yourselves. So I had a consultation with them and they ordered in all of the flowers and then we went up and did all of our flowers ourselves. Jason Mraz, “I Won’t Give Up.” I let Adam choose the first dance song and it was a surprise for me because I had no idea what he had picked. Whitney and Adam live in Athens, Ohio, with their daughter Finley who is 4 years old. They are expecting a baby boy in April 2018. They have a 10-year-old Lab named Lucie. We met in high school. We had a math class together in 2010 and started talking/dating in 2011. He was a senior and I was a junior. We went on a turkey hunt on April 24th of 2016. As we were walking out of the woods there was a deer’s shed antler that Taylor had placed in the woods hoping that I would see it that morning. After him stalling to keep me in the area where it was lying and giving me a chance to see it (without blatantly telling me that it was there), I picked it up. I was so excited. We enjoy looking for deer sheds in the spring together, and it is always great when I find one. To my surprise when I looked at it, it said “Marry Me?” on it. Once I realized what was about to happen and turned around he was down on one knee. What was the one moment that stood out on your special day? Her moment: A moment that stuck out to me was the exchange of vows and rings. A lot of moments stick out to me from this day, but this was one of the most important parts to me. His moment: A moment that really stands out in my memory was walking back into the venue before dinner and being announced as Mr. and Mrs. Taylor Bolin; that moment helped everything click in my mind that it had all actually happened, and is a moment I’ll never forget. 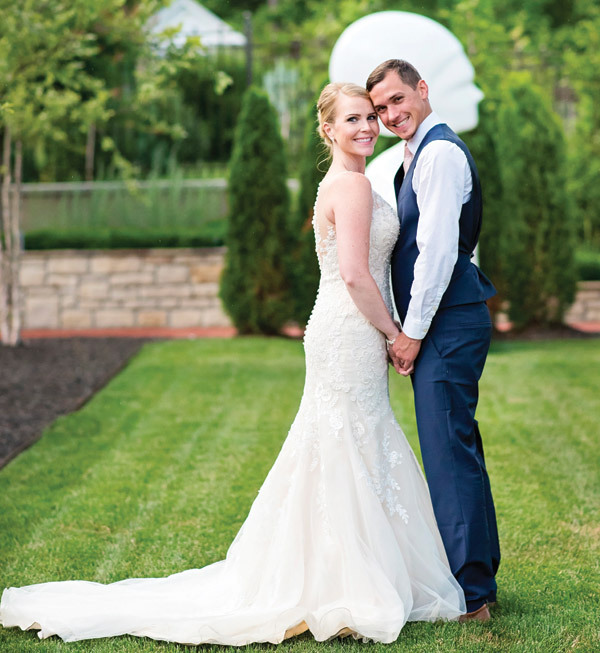 The bride wore an ivory, strapless gown with a lace overlay. The waist was accented by a satin belt and rhinestone broach. The bridesmaids wore chiffon gowns in eggplant just above the knee. 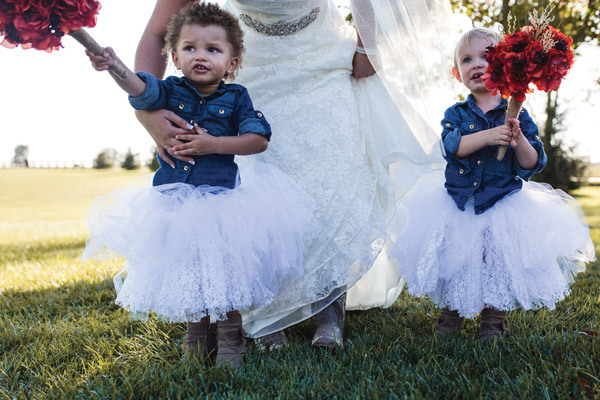 They donned cowboy boots for a bit of rustic flair. The groom and groomsmen wore coordinating shirts and dark jeans for the occasion, and the groom wore a taupe vest. 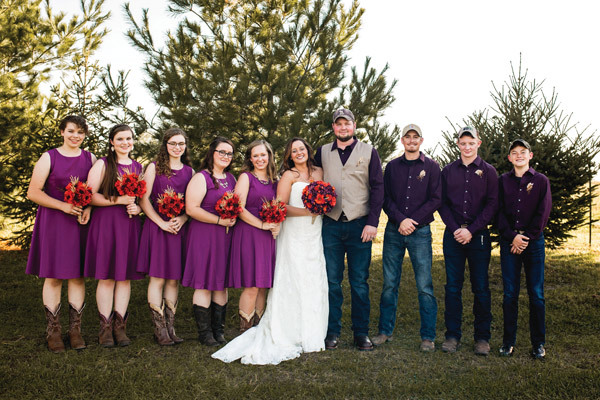 The Sementilli family designed the flowers for the wedding in rich shades of purple and orange. 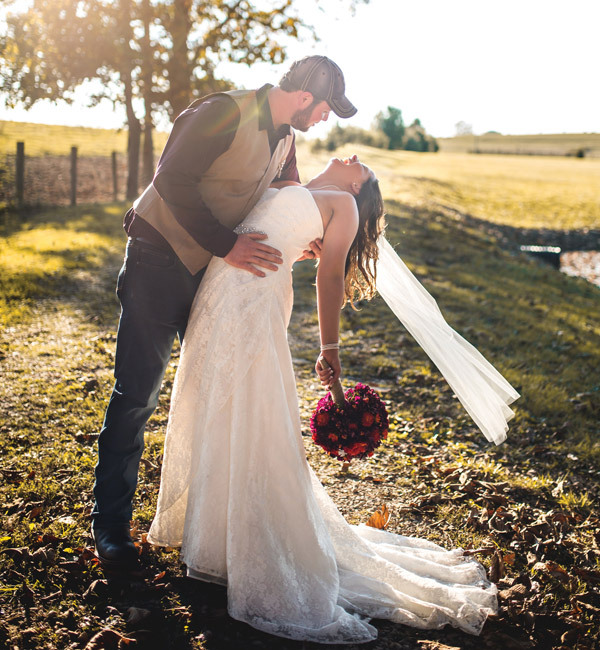 Taylor and Kayla have made their home with their two dogs, Gunner and Spade, in Meigs County, putting down their roots close to family and friends. At Dairy Queen where we both worked! We went to the La Jolla tide pools in San Diego, the place where he was born, during sunset. He got down on one knee. His brother was secretly filming. Her moment: It wasn’t really a moment but a series of moments. Joey was just so excited and happy (and pretty drunk). He was bouncing around to different people, visiting with them and thanking them for coming. I just remember watching him running around with the biggest smile on his face. His moment: (Samantha) coming out the door and walking down the aisle. It’s cliche, but for a reason. I was very, very overcome with emotion, excitement, and peace. The bride wore a champagne gown with a chiffon and tulle skirt with floral lace accents. The fitted bodice was embellished with rhinestones and a satin belt. 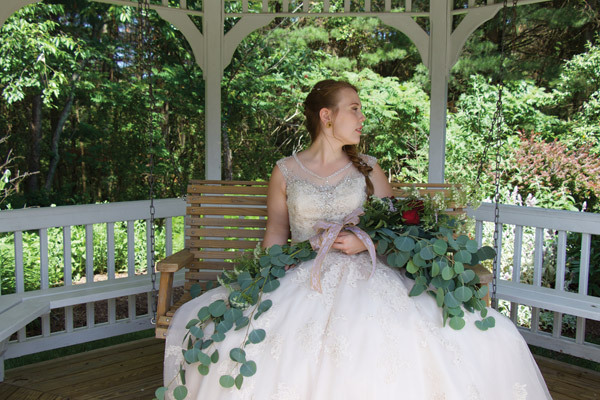 The bridesmaids wore dresses that suited their individual style and tastes in varying shades of sage, blush, and plum. The groom and groomsmen wore dark olive chinos with white shirts and vests. We ordered flowers in bulk from fiftyflowers.com and arranged them by ourselves. The bouquets were cascading greenery with deep red roses. For now, Joseph and Samantha have made their home in Washington County, though they expect life will take them elsewhere in the future.